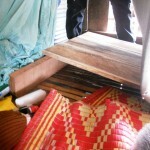 To assist Sokha to sit and hopefully use a wheelchair, we have made a ramp to place under the mattress to support her back, we will raise this once a week to see if she can slowly adjust. At the moment she cannot hold the sitting position for too long, she feels sick and gets dizzy. Four months ago Sokha fell off the back of a truck, she was paralyzed and in agony she could not afford an operation. Her son Channy quit school to mind his mother. Sokha lay on wooden slats for 10 weeks until CHOICE was notified, we immediately contacted C.S.C. Hospital. It is now seven weeks since Dr. Jim and the CSC staff operated on Sokha, her neck was broken in two places. She is no longer in pain and can now be raised to a sitting position for a few minutes. We expect further improvement with exercise. They do not own the grotty little hut with the dirt floor that they call home, they are allowed to live there rent free as they have little money. They had enough rice for three days after our last visit 2 days ago, so we gave them $10. 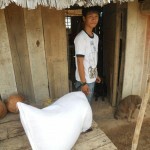 On Tuesday the 10th May we delivered 1 bag of rice and 2 box’s of noodles. Can you help, if you can donate even a small amount it will be used to pay for food for this family. See our Choice Donations page. CHOICE was able to raise and donate $500 to the Childrens Surgical Center for their efforts. We thank B.Jones US, Rio Norde Germany and R. Wright Australia for donating the $500. Special thanks to Dr. Jim Gogally and the C.S.C. Hospital. 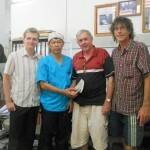 Pictured from left Eric, Dr.Sokleng, Ross and Mark presenting the $500 to C.S.C.